The world population and the world economy have grown rapidly since the start of the Industrial Revolution in Europe. There are around 12 times more people on the planet today than there were in the 1700s. The world population has roughly tripled in the last seventy years alone. The world economy has grown even faster than the world population. Although the world population continues to grow, its growth is slowing substantially as the world industrializes. The global fertility rate—essentially, the average number of children a woman has—fell from a peak of 5.1 in 1964 to 2.4 today. In other words, the average woman of childbearing age has roughly half as many children today as fifty years ago. Since each woman has to average a little more than two children (since not every child survives to reach childbearing age) to replace to previous generation, the fertility rate is approaching the minimum it takes to keep the population stable. The fertility rate has already fallen below replacement levels in roughly half of the world. 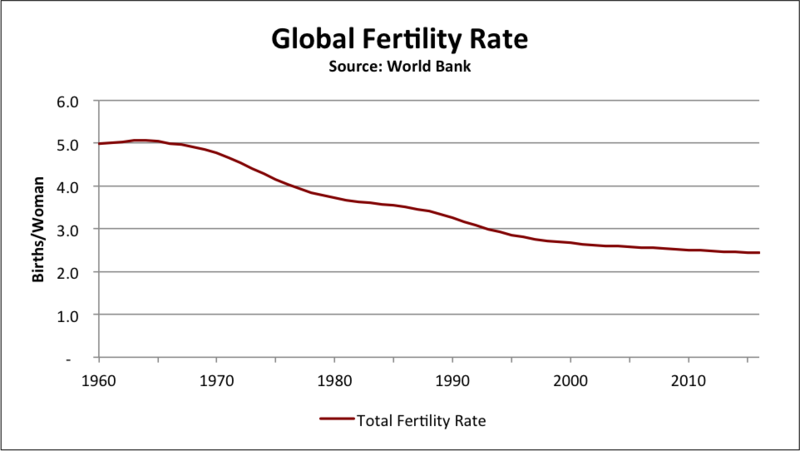 If the global fertility rate continues to fall, the world population will eventually fall too. The world appears to be approaching “peak child”—the point at which the number of children in the world plateaus. The growth of the population of children under 18 has slowed dramatically since the turn of the century. The world population will continue to grow as people continue to live longer lives, but population growth seems to be stalling. 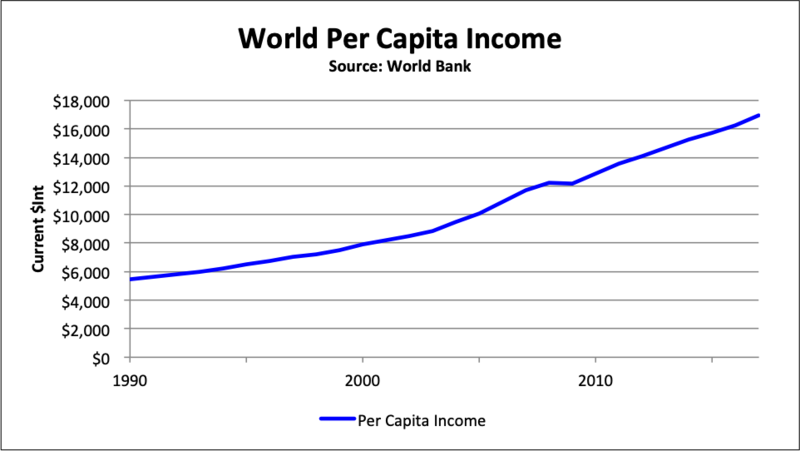 Global per capita income grew by an average of 4.3% since 1990, although it did fall slightly in 2009 after the global financial crisis. That means that the average person today has more than three times as much purchasing power as the average person in 1990. For billions of people around the world rising incomes mean better access to food, education, and health care. As incomes have risen, the percent of percent of people living in extreme poverty around the world has fallen dramatically—75% between 1981 and 2013. But around 10% of the global population still lives on the equivalent of $1.90/day or less (in 2011 dollars). Child mortality has also steadily fallen. The percent of children around the world who die before the age of five dropped more than 75% between 1960 and 2015. But globally 4% of children still die before the age of five. In spite of concerns in the 1960s that the world was running out of food, world grain production has continued to grow steadily. The world currently produces more than 2.5 times as much grain as it did in 1950. Since 1950, world grain production has grown slightly faster than world population. Although there are still legitimate concerns that food production may not be able to keep up with future population growth, we produce nearly 30% more grain per person than we did in 1950. The amount of energy we use has grown even faster than world population in the last half century. Although it fluctuates from year to year, the amount of energy we use person has risen almost 1% a year since 1971. On average, we each now use roughly the energy equivalent of about 1.9 metric tons of oil every year—about 44% more per person than we did in 1971. Global CO2 emissions have almost quadrupled since 1960 and continue to grow steadily. A recent Intergovernmental Panel on Climate Change report found that at the current rate—even if CO2 emissions stopped growing today—the world could be as much as 1.5°C (2.7°F) by 2040, with potentially devastating consequences. CO2 emissions have also grown faster than world population. On average the amount of CO2 we emit per person has generally increased as less-developed countries industrialize. Per capita CO2 emissions have been flat since 2011, but globally we still emit more CO2 per person now than at any other time in history. Nevertheless, CO2 emissions grew more slowly than the world economy. We are increasingly efficient in the sense that we emit less and less CO2 for every dollar of goods and services we produce. 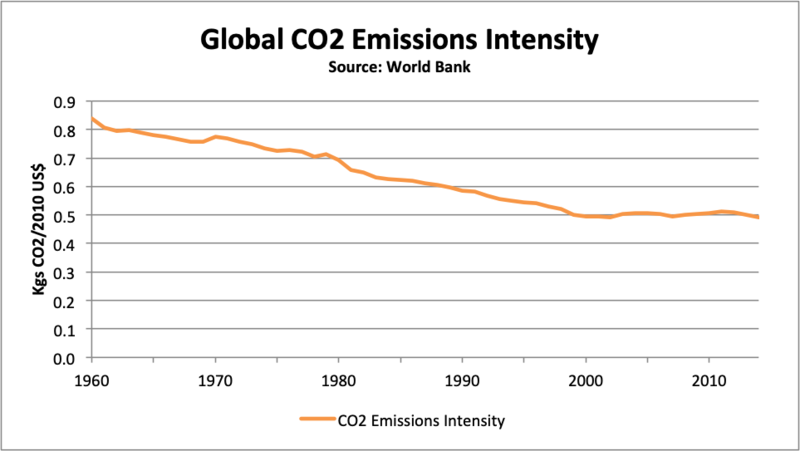 According to World Bank data the real emissions intensity of CO2 has fallen 41% since 1960. That means we produce almost twice as much now for every kilogram of carbon we emit into the atmosphere as we did in 1960. 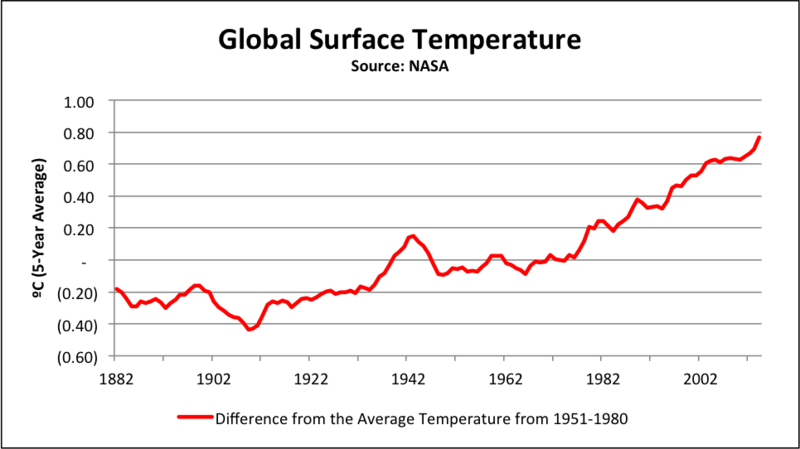 The mean surface temperature of the planet has been rising steadily since the early 1900s. The mean surface temperature is roughly 1.0 ºC (1.8 ºF) higher today than in 1900, making this the warmest the planet has been since we began keeping accurate records. 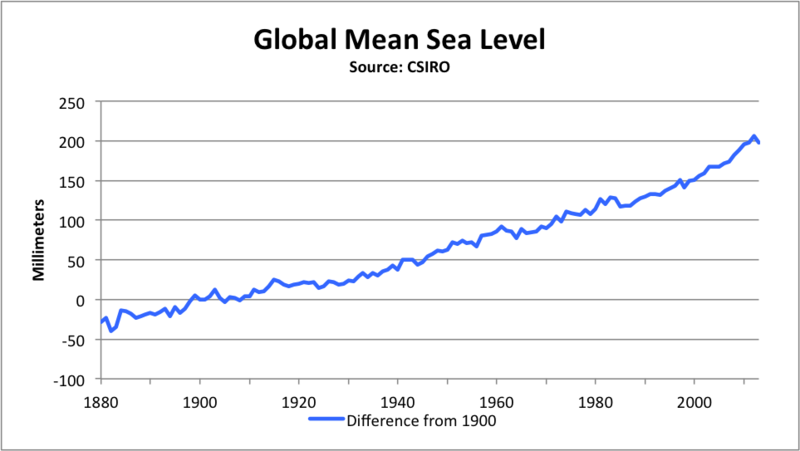 Sea levels rise as sea water expands and as land ice melts into the oceans. Sea levels rose around 150 millimeters—about six inches—in the twentieth century. They have already risen another 48 millimeters in the first thirteen years of this century. In 1965, Gordon E. Moore noted that the number of components in integrated circuits was roughly doubling at a constant rate. 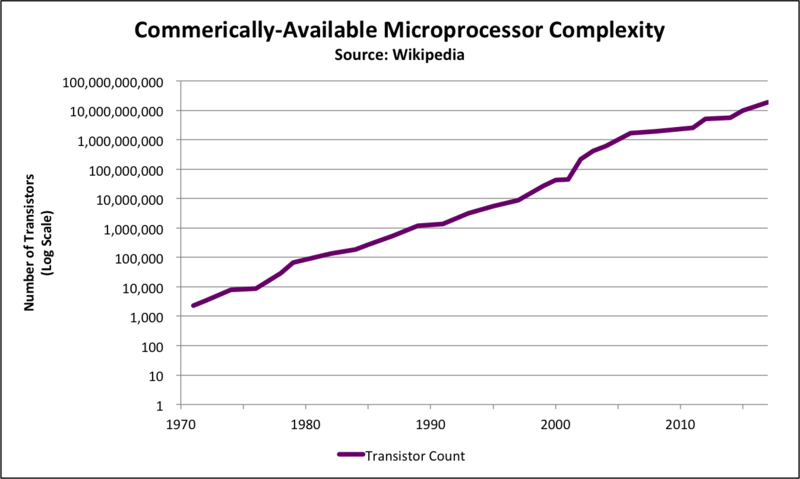 Since 1971, the number of transistors on the most-complex-available integrated circuits has doubled roughly every two years—a phenomenon that has become known as “Moore’s Law”—although there are reasons to believe we may be approaching the physical limits of circuit miniaturization. NOTE: All of the data here are estimates, although I try to use the most authoritative estimates available. I have left error bars off these graphs—in those cases where the error can be accurately estimated—for the sake of clarity and simplicity. To explore these issues more deeply, I recommend the invaluable Our World in Data. Help me improve my data by letting me know if anything here is wrong or misleading. All charts are licensed under a Creative Commons Attribution 3.0 Unported License. Church, J. A. and N.J. White (2011), “Sea-Level Rise from the Late 19th to the Early 21st Century.” Surveys in Geophysics, 32. Hansen, J., R. Ruedy, M. Sato, and K. Lo (2010), “Global Surface Temperature Change.” Reviews of Geophysics , 48. Moore, Gordon E. (1965), “Cramming More Components onto Integrated Circuits,” Electronics, 38:8.